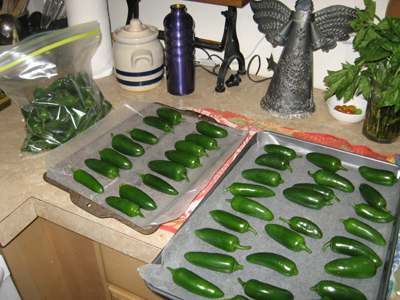 I started on Saturday morning with a bag of compact, shiny jalapeno peppers. The label on the seed packet doesn’t lie: “Hybrid pepper, mild, jalapeno chile, dulce F1,” also from Johnny’s Selected Seeds. These are jalapenos custom-made for me: I like a bit of bite, but only enough to complement my scrambled eggs, and only enough to complement the fresh tomatoes in my salsa. “Dulce,” indeed. Layed-out on waxed paper on cookie sheets, popped into the freezer, until they were frosty little green bullets. Into a freezer container, and DONE! Even my heirlooms were LOADED with juice. I had to gently simmer it down a bit. 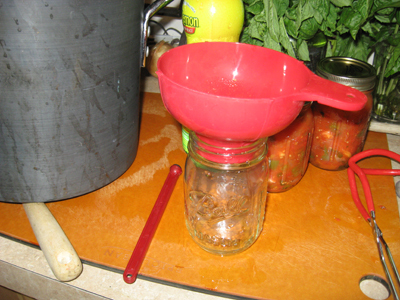 A heated jar, and the wonderfully low-tech tool of a wide-mouthed funnel, sized just for a Mason jar. I am a junkie for perfectly functional tools. I also like that it's red. 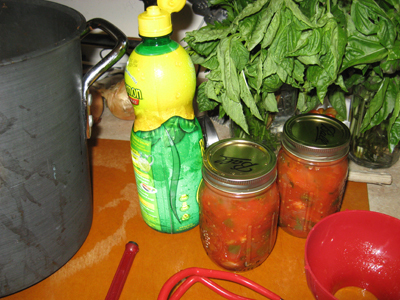 Apparently tomatoes are so deadly, when canning, that you have to heat the jars, heat the tomatoes, add acid (look in the background) and then cook, cook, cook in hot water. This is me, not poisoning people, at the rate of 1 teaspoon per pint. My last experiment was more of a nod to the masses rather than to myself. I understand that people like pickled peppers. Me? Not so much. 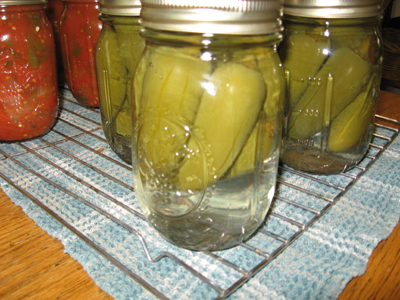 But I had a LOT of jalapenos, and I have almost as many friends, so I thought I’d pickle some, try one jar, and if they were nice, then I’d give the other jars away as gifts. These also had the advantage of being a LOT easier to produce than the labor-intensive tomatoes. 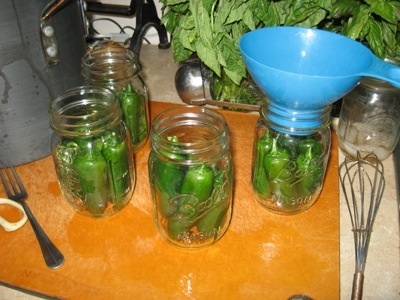 I didn’t have to prep the peppers other than just packing them tightly into the jars. 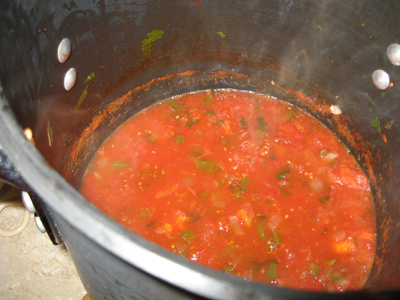 The recipe didn’t list using “hot” jars, but my recent brush with deadly tomatoes had made me nervous, so I heated them anyway, and braved the hot glass to shove the peppers in, standing upright. 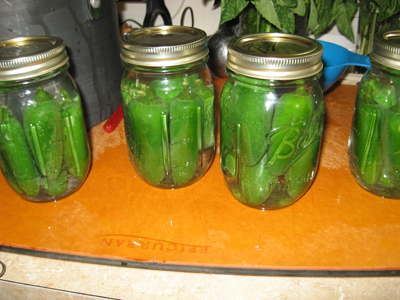 One problem I quickly discovered is that only 5 jalapenos will stand upright in a pint-sized jar, leaving about 1.5 inches of headroom. Not enough for a second layer of peppers. It seemed a waste of space, but I wasn’t sure what to do about that. 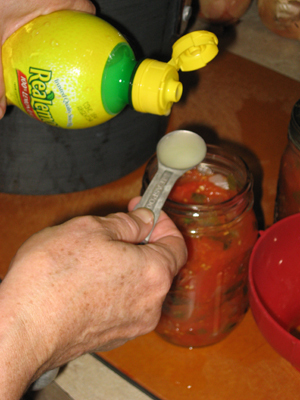 I made the pickling liquid, again a relief from work, because it was simply equal measures of vinegar and water, and some salt. I heated it to simmering-only (apparently vinegar is volatile, and leaves if you boil it), poured it over the peppers, and processed the jars in a hot-water bath. See? Packed, vinegar-ed, and about-to-be processed. But I was dismayed to see that after processing, that 1.5 inches of headroom became bottom-room as the peppers floated upward in the jar. I think it is an unattractive look, way-too reminiscent of a specimen bottle in a creepy lab. The next adventure? Searching for the monarch caterpillars that looked like they were thinking about becoming chrysalis’, and seeing if my lima bean bushes have produced anything more edible than branches and branches of tiny white flowers. Photos to come.